The rando/wanna-be rando scene is blowing the f up yo. 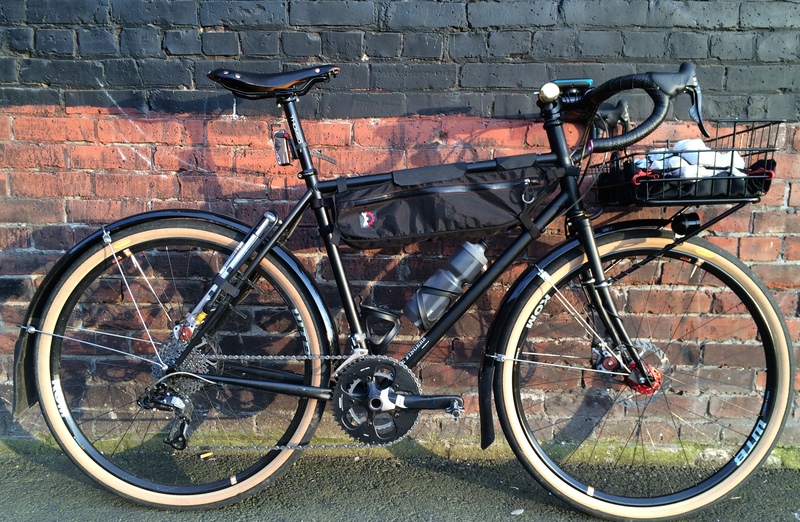 Every other bike has a front rack and a bag. Word. Spec’d with Campy 10sp shifters, sram drivetrain. SON hub with Schmidt Edelux light front, color matched King r45 disc rear. Wheels built by Ben @ Back Alley Bike Repair. Grand Bois Hetre tires. Haulin Colin porteur rack with basket from Goodwill. Selle Anatomica X saddle. Tangle frame bag by Revelate Designs. Curb weight with fenders is ~35lb. This is Josh’s Rawland dSogn and he works with me on Clip-n-Seals and our Internet Famous Tool Roll.